Attempting to shoot a swinging child can be a frustrating experience. As shot after blurry shot fills your memory card you start to lose hope that you’ll ever get one in focus. Here are a few tips to help you photograph this difficult but rewarding subject. Don’t get hit by the swing. It’s easy to forget where you are and step too close when you are concentrating on the photo. This is especially a problem if you are also pushing the swing. An assistant and/or a telephoto or zoom lens is called for here. Also, stand slightly off to one side. This allows you to stay close without being directly in the path of the swing. It has the additional benefit of a more interesting 3/4 view composition. A fast shutter speed and fill flash were used to freeze this swinging boy. A zoom lens kept me out of harms way. Use a fast shutter speed. Swings are deceptively fast. Use 1/200s or better. Time your shot to coincide with the peak at the back swing. This is the moment when the swing is both moving the slowest and puts the subject in a good position. Fill the frame. Off-center or rule of thirds composition isn’t so important for these. Fill the frame with flying hair and a huge smile. Focus will be your biggest enemy. If your camera can’t focus quickly enough at the peak moment, either prefocus on something else at the same distance or preset your focus for maximum depth of field. Take lots of shots. Even at your best, many will turn out blurry or with an unappealing pose. Check the exposure. 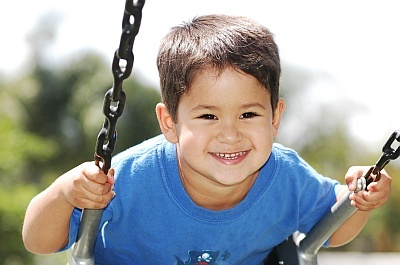 If the swing set is in full sun on a bright day, add some exposure compensation: +2/3 to +1 stop should do it. Or use fill flash, my preference, so that your subject isn’t underexposed against a bright sky.